Small Animal Talk: Do cats suffer from dementia? Do cats suffer from dementia? In short, yes. Below is a revised version of an article I wrote a few years ago on the topic, but its something I get asked about a lot. Since I was a kid the lifespan of cats has increased massively – probably due to the availability of excellent nutrition, advances in veterinary medicine and the move from cats as primarily outdoor to primarily indoor pets (maybe this relates in part to better flea control?). Anyway, whereas cats in their late teens and early twenties were relatively rare a decade ago, the proportion of senior and geriatric cats seen in veterinary practice has grown enormously. One study showed a 15 per cent increase in cats over the age of ten in the US over the past ten years. Figures from the UK suggest that more than 30 per cent of the pet cat population can be classified as “senior”. [It does depend on your definition. Laboratories tend to classify cats over 7 as senior because that is when they tend to start to see laboratory changes that reflect age-related conditions]. So…a longer life is super news for cats and owners, and reflects in general their better care. BUT… there is a down-side to the aging of the feline population. With age comes increased prevalence of chronic diseases, cancer and dementia. Dementia, or cognitive dysfunction syndrome, is an age-related condition commonly associated with behavioural changes in cats. Owners may report that their cat seems a bit “senile” or “doddery”. According to one study, around 28 per cent of cats aged 11-14 years old showed signs of dementia. As one would expect, this figure increased with age, and 50 per cent of cats aged 15 and over showed signs of dementia. To put this into perspective, as far as age goes, a 15 year old cat is roughly equivalent to an 85 year old person. According to some scary stats, up to 50 per cent of us show signs consistent with dementia at that age. There is still much to be learned about senior dementia in cats and no single underlying cause has been identified. We still don’t know if dementia is solely due to inevitable aging of the brain, or whether it is due to a single, or multiple, treatable disease processes. There is evidence that dementia is associated with pathological changes in the brain. These changes include vascular disease, changes in the activity of neurotransmitters, a decrease in brain mass, an increase in the rate and extent of free radical damage to brain cells and the deposition of amyloid plaques – in other words, the same types of processes that occur in people with dementia. Another thing that we don’t know is whether the extent and severity of these changes is associated with the extent and severity of behavioural changes. Obviously if we knew the underlying cause we could develop a treatment to prevent or cure dementia. If we knew how changes in the brain reflected changes in behaviour, we might be able to use this information to give owners a more accurate diagnosis and prognosis for their cat. Alas we do not. There are numerous behavioural changes consistent with senior dementia in cats, but none of them are specific to dementia. That means that there are other conditions that can cause these signs, so diagnosis of dementia can never be made on the basis of signs alone. Inappropriate vocalisation, particularly at night. In my experience this is one of the most common signs of dementia and can be very upsetting for owners who are trying to sleep. Affected cats tend to emit a loud, guttural cry (sometimes for hours on end), for no apparent reason, and may appear distressed. Changes in social relationships. For example, cats that were once affectionate may become very aloof, irritable or even aggressive. Some owners complain that their cats incessantly demand attention. Confusion and disorientation. This may manifest as forgetting where doors, walls and furniture are located, forgetting the location of the food bowl or forgetting where the litter tray is. Others may pace relentlessly, wander aimlessly or stare at the wall. Some animals seem to forget that they have been feed…and keep harassing owners (though its pretty hard to distinguish this from a cat with an increased appetite, which can be a sign of hyperthyroid disease or diabetes mellitus). Inappropriate urination or defecation (i.e. doing it where one should not). This sign is particularly upsetting to owners. Changes in sleep-wake patterns. In particular, cats that once slept through the night may get up at all hours. Some owners observe that their cat sleeps more or less than usual. Decreased response to visual and auditory stimuli. Some cats may show signs that they have seen or heard something (looking or turning towards it) but may seem to be confused about how to react. Change in appetite. In my experience many affected cats show an increased interest in food, but loss of interest is quite common too. Reduced grooming behaviour. This may be evidenced by a dishevelled or rough looking hair coat. Signs may be subtle at first, but they tend to become more pronounced over time. Diagnosis of dementia in cats is not easy because, as mentioned earlier, many other medical conditions known to affect older cats result in similar clinical signs. For example, cats suffering from arthritis may vocalise or avoid climbing in the litter tray due to pain. Cats with diabetes or kidney disease may urinate inappropriately or exhibit changes in their appetite. Cats with thyroid disease may exhibit dramatic behavioural changes, including aggression and a ravenous appetite. 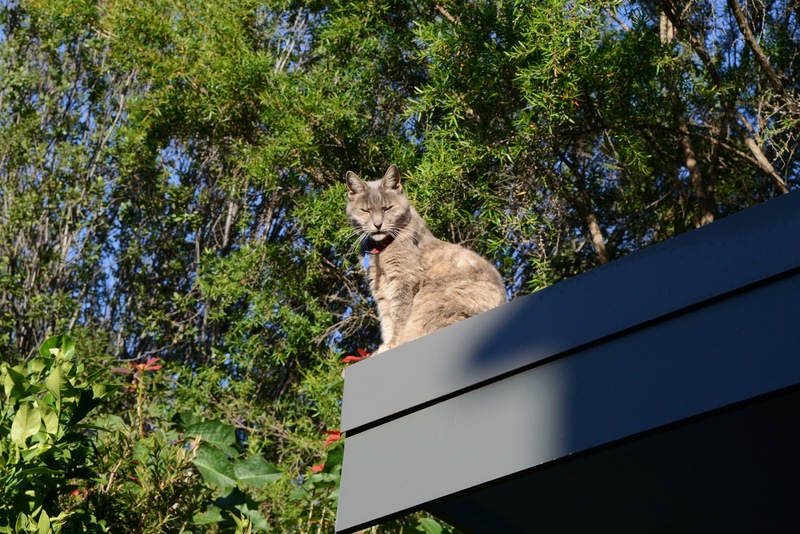 Other conditions that may cause behavioural changes in senior cats include high blood pressure, urinary tract infection, diseases of the nervous system, loss of sight and hearing, dental disease, brain tumours and any condition that causes pain. And stress (for example regarding a new cat that moves in next door) can manifest as all sorts of behavioural changes including some crazy litter tray action. 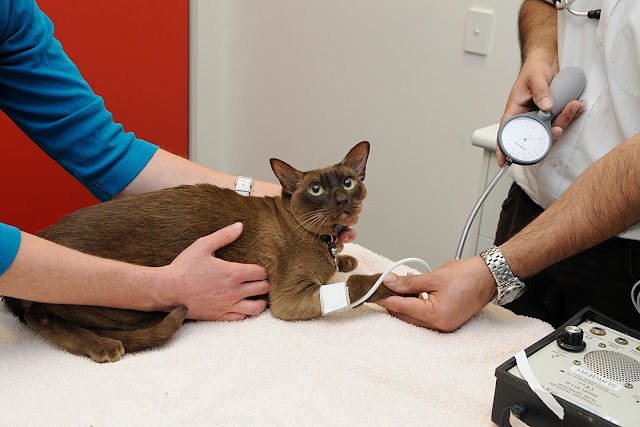 A cat has blood pressure measured. Vitamin B1 (thiamine) deficiency, common in cats fed fresh meat containing sulphur dioxide preservatives, can also cause some dementia-like signs. Unfortunately it can be difficult to tell which pet meats contain these preservatives or which don’t. Some cats respond to thiamine supplementation and withdrawal of the offending diet, but thiamine deficiency can cause permanent brain damage. There is no single diagnostic test for senior dementia. Rather, it is a diagnosis of exclusion. That is, your veterinarian will need to rule out other medical conditions before determining that the changes in your cat’s behaviour are due to dementia. One complicating factor is that older cats may have multiple medical conditions in addition to dementia. In these cases it is difficult to determine what proportion of behavioural signs are due to dementia and what proportion are due to the other conditions. Your veterinarian will initially take a full history, including any medication your cat is taking, previous medical conditions such as trauma, exactly what your cat is eating and any recent environmental changes. You will be asked about the behavioural changes you have noticed in your cat, and whether there have been any changes in appetite, thirst, urination or defecation. This is followed by a full physical examination, which may include a neurological examination, to determine whether there are physical signs of illness. The next stage involves running a panel of tests. This includes a complete blood count, a biochemistry panel, thyroid hormone levels and urine analysis. These tests will help identify the presence and extent of kidney disease, thyroid disease and other conditions such as diabetes or liver disease – all of which may cause apparently senile behaviour in cats. In addition, blood pressure measurements may be taken. Hypertension or high blood pressure is reasonably common in older cats, although taking their blood pressure is not as simple as it is in a human patient. The act of putting a blood pressure cuff on a cat’s limb for the first time is often enough to send the blood pressure off the scale – so your veterinarian may hospitalise your cat for the day and take a series of blood pressure measurements, using the average of these. [And even then the odd cat just doesn’t approve of having a cuff placed on its limbs]. Depending on the physical findings and the results of these tests, your veterinarian may suggest your cat undergoes further tests if necessary. 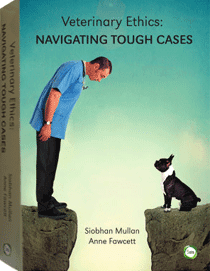 These might include blood tests for feline leukaemia or aids, toxoplasmosis or cryptococcosis. Ultrasound and x-rays can be very useful in detecting some conditions which may be associated with dementia, such as heart disease or cancer. Finally, what we can advanced imaging – the use of magnetic resonance imaging (MRI) or computed tomography (CT) may be required. Advanced imaging may pick up things such as brain tumours. One of the more common operable brain tumours in the feline patient is the meningioma – but brain surgery is a specialist procedure. [One prominent Sydney surgeon describes meningioma removal as a “brain spey”]. 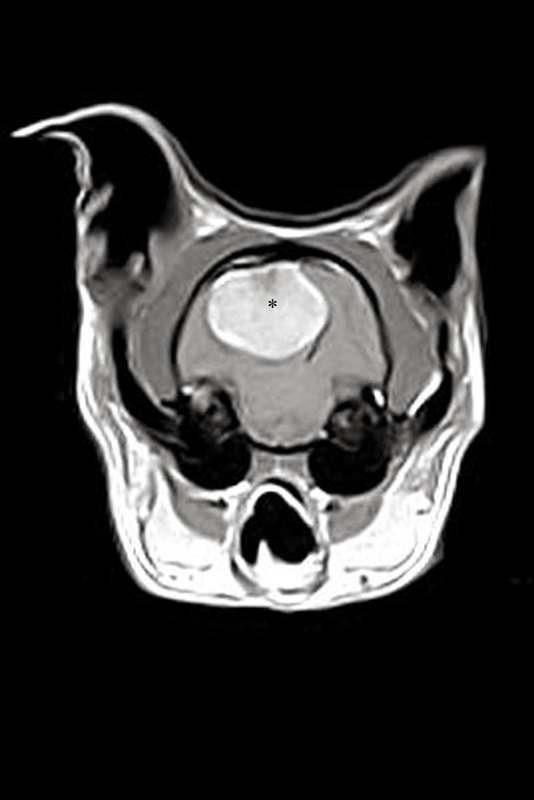 Image showing a brain tumour in a cat (the big white mass marked with an asterisk). Courtesy of Dr Katja Voss, University of Sydney. Where no underlying medical reason for behavioural changes can be found, your veterinarian may make a presumptive diagnosis of senior dementia. It is likely that as we learn more about the underlying causes of dementia in cats, targeted treatment will become available. Until then the treatment options are based on extrapolation of data from people and dogs, and it must be emphasised that there is currently no registered treatment specifically for feline senior dementia available in Australia. Other treatment options include anti-depressant type drugs (particularly the monoamine oxidase inhibitors), anti-anxiety drugs (such as some benzodiazepines) and non-steroidal anti-inflammatory drugs. Because these drugs may exacerbate other medical conditions it is important that they are prescribed by a veterinarian after a thorough assessment of your cat. Anti-depressant type drugs can take several weeks to take effect. A question we are commonly asked is whether the cat can take the same medication that the owner is taking. Generally NOT. Doses between cats and people vary, and again, it is vital that every patient is assessed prior to medicating to reduce the risk of adverse effects of medication. Nutraceutical dietary supplements containing antioxidants, essential fatty acids and free-radical scavengers may reduce degenerative changes in the brain, although there are no formal studies which show this is the case. It is important to only use products designed for use in cats, as some products intended for use in humans and dogs may be toxic. What works for one cat may not work for another. This may reflect an underlying variation in the cause of dementia between cats. In cats with multiple medical conditions such as arthritis or diabetes, treatment of these can improve your cat’s overall health and reduce dementia related behavioural signs. In addition to treatment, making changes at home to keep your cat comfortable, such as providing an extra litter tray (or two) and sticking to a routine when it comes to feeding may help. These cats tend to get very stressed in the face of major changes, so avoid rearranging the furniture or changing the position of their bedding and bowls. These are not cats who would be thrilled with the introduction of a new kitten or puppy. Old cats with dementia are not very quick on their feet. They are less able to retreat from dogs, other cats or motor vehicles if they need to. Thus keeping them indoors, or allowing them outdoors under supervision, may be the safest option. Often cats are not diagnosed with dementia until it is very advanced. This means that even with the best veterinary care there may be little we can do to reverse or reduce the behavioural changes associated with dementia.